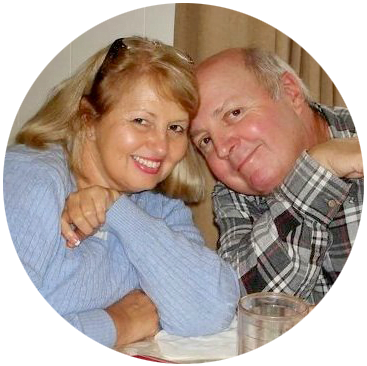 I hope everyone had a wonderful Thanksgiving holiday. We were blessed to have two days that we enjoyed with our family, but now my thoughts have turned to getting the house ready for Christmas! You too? Well, I thought I’d share one tree that is finished and that is our chicken wire kitchen tree. 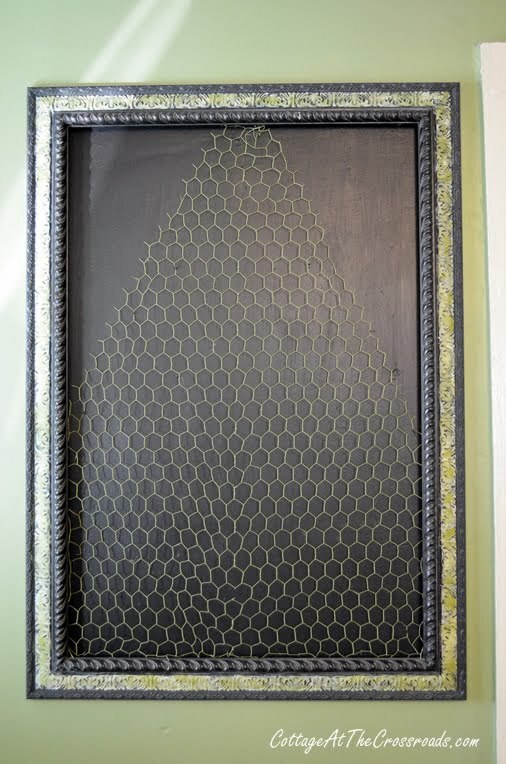 Most of you know that there is a large chalkboard on one wall in our kitchen and I usually decorate it with a wreath. But since we have a lot of chicken wire around the cottage that we use in our garden, I got the idea that I’d make a tree with it. 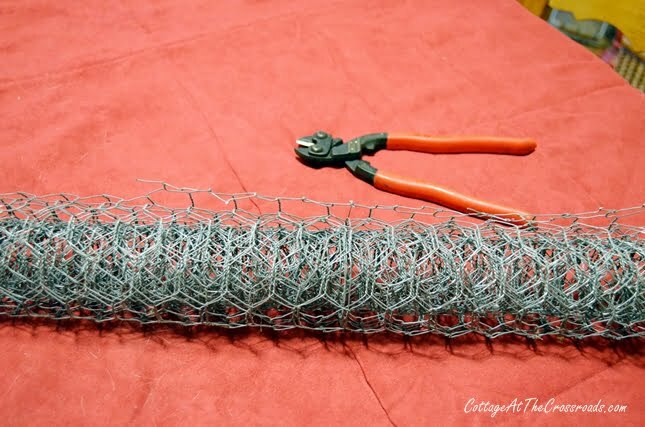 Now I’ll have to admit that working with chicken wire is not easy! 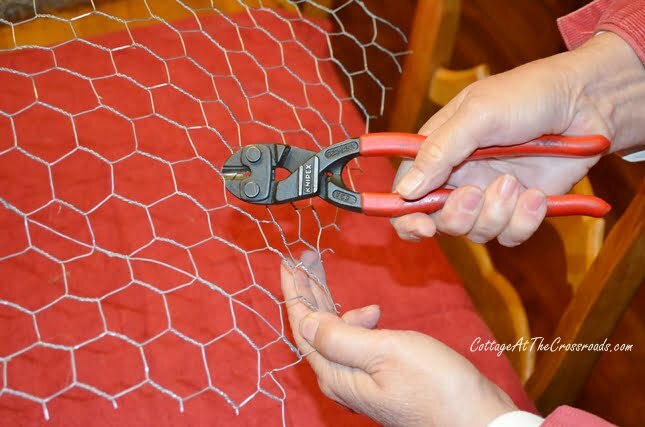 You will need some wire cutters and someone to help hold the wire so that you can cut it into the shape that you want it. 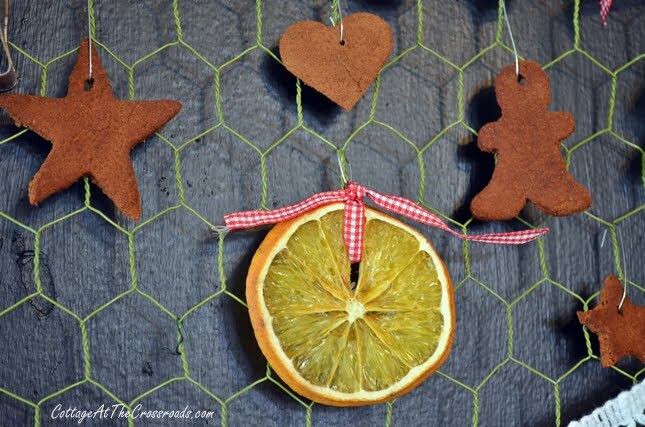 I decided to dry some oranges and make some cinnamon ornaments to hang on the tree. I always associate oranges with Christmas because, as a child, I always had one in my stocking on Christmas morning. That’s because years ago, oranges were expensive and rare, and getting one was considered to be a real treat. 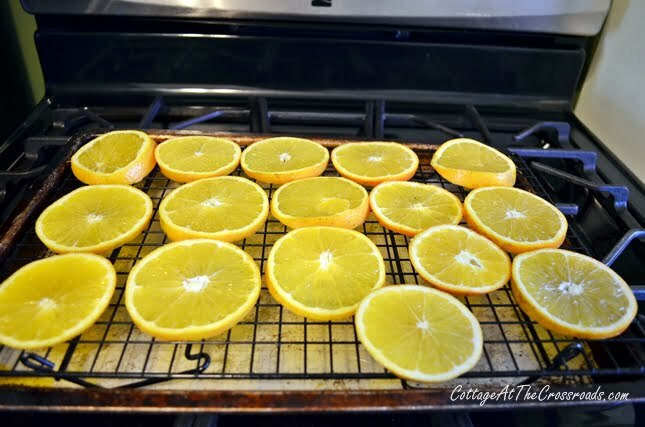 To dry the oranges, I sliced several about 1/4 inch thick and placed them on a rack down inside a baking sheet in a 200 degree oven. They dried out after about 3 hours, and I turned them about halfway. 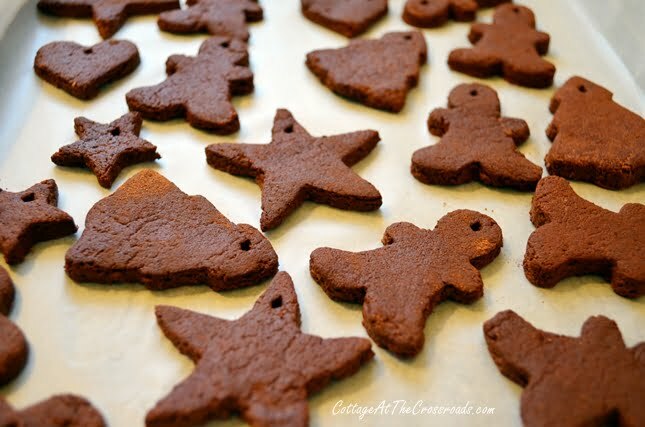 The little cinnamon ornaments were made with just 3 ingredients, and they smell so wonderful hanging on the tree. To make the cinnamon ornaments, you only need 3 ingredients. 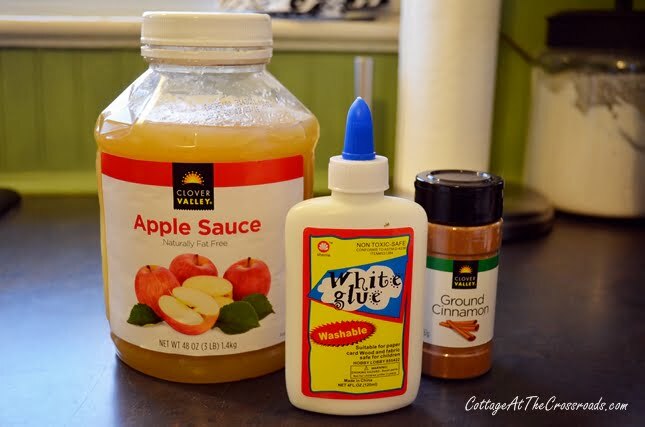 My good friend Sherry found the recipe HERE and sent it to me. 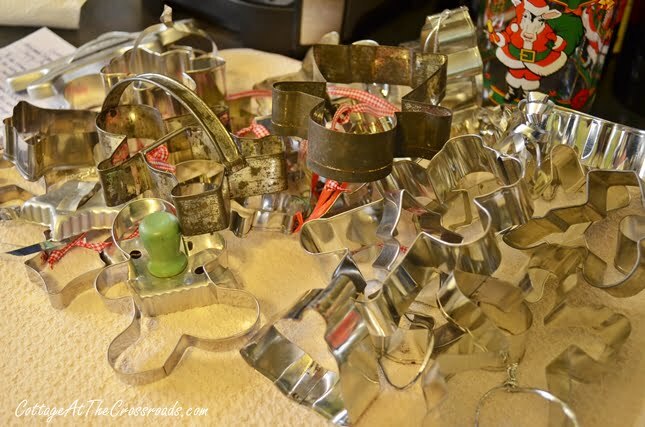 To cut out the shapes, I pulled out some small cookie cutters. And while I had my cookie cutters out, I decided to glue a little scrapbook paper on the back of some of the cutters to hang on the tree. 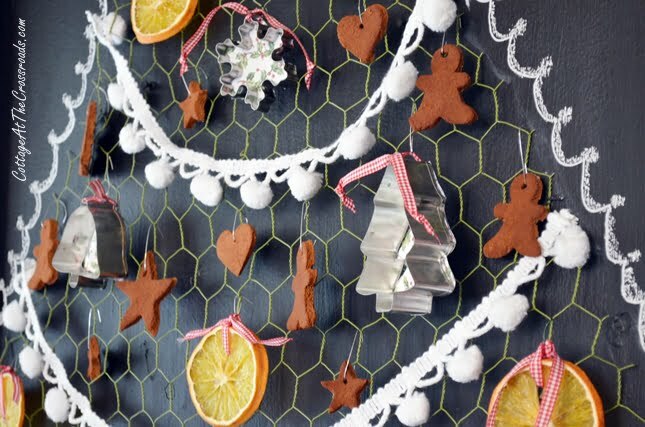 And you know, you just can’t have a Christmas tree without a little garland, can you? So I pulled out some white pom-pom trim that I already had. And since this is a chalkboard after all, I added a chalk edge to the tree. Can you tell I had fun decorating this tree? 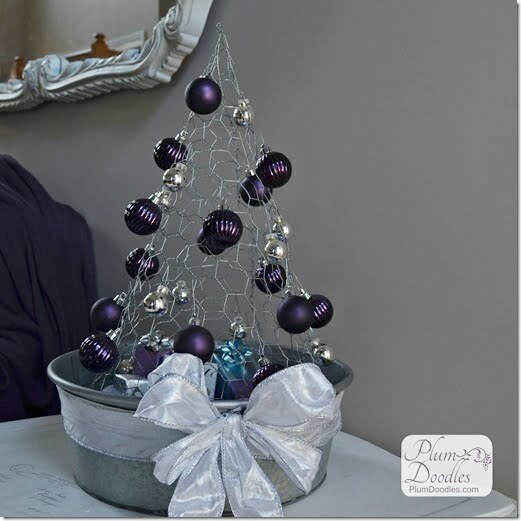 This metal bow that I found at Hobby Lobby make the perfect topper to the tree, don’t ya think? The scent of oranges and cinnamon is the first thing that greets people when they enter our kitchen. There’s nothing better to let people know that the holiday season is here. 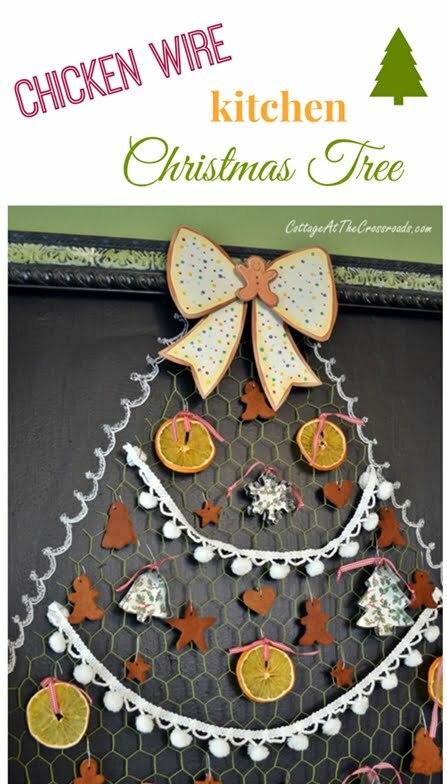 Want to see another chicken wire tree? I just had to show you this adorable tree made by my friend Sheila. You can find her directions HERE. 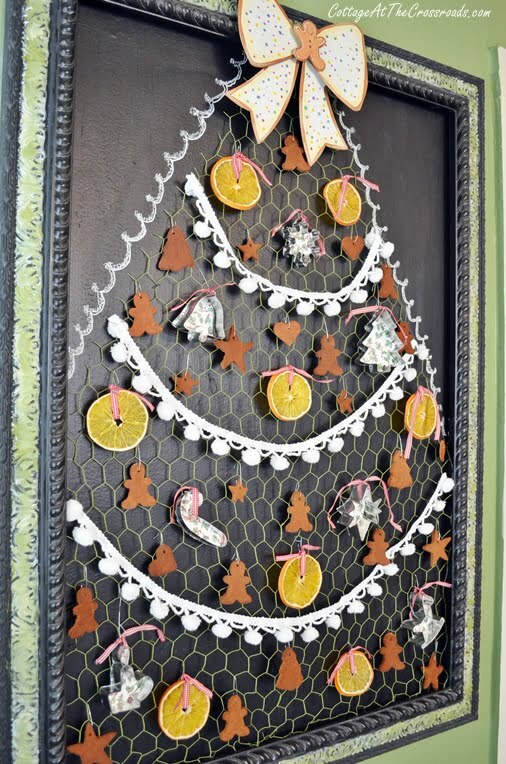 Jane, your tree is so very adorable!…I love that you can hang the ornaments on the chicken wire…and what a great idea to use that cute ball fringe for garland…you did it again…another super creative project for us to enjoy!!! Jane this is so cute. You are so creative. Great job as always!! Your tree is better! 🙂 Seriously, I love it! I may have to brave the chicken wire again. I still haven’t gotten/ made a topper for mine. Thank you for sharing it. Jane that is too cute and I love that you painted the wire green. You are so creative! That is so creative, I love it! So cute! Very cute. 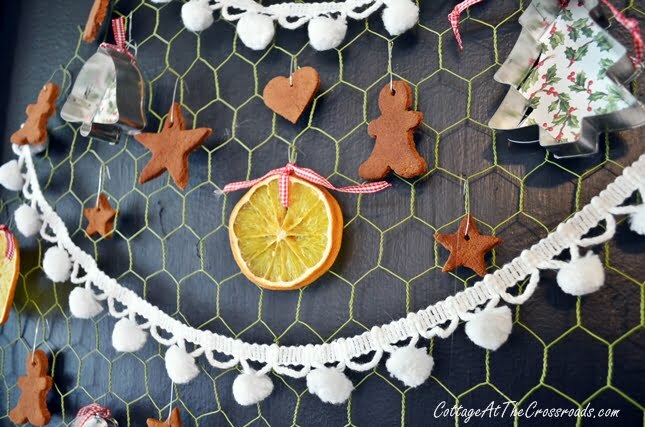 Hope you don’t mind ,I am going to use your idea to make a garland for my kitchen window. So cute ! 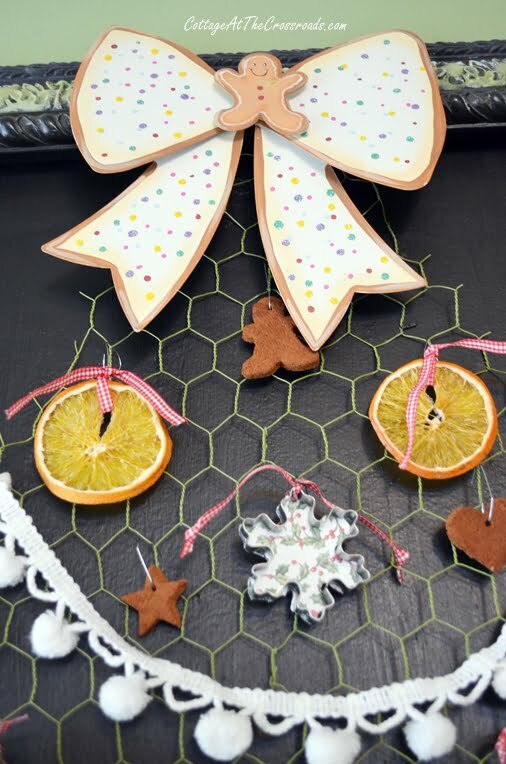 Love your little cinnamon ornaments ! I love to make and smell cinnamon ornaments! Might just have to make some this year.